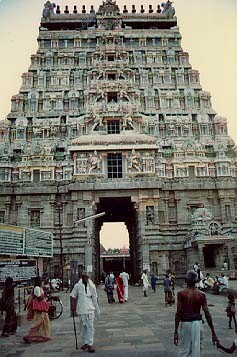 The Chidambaram Natarajar temple is a specimen of the assimilation of several architectural styles. The innermost sanctum of the temple, houses the grand images of Shiva (Nataraja) and Parvati (Sivakami) in the ChitSabha or the hall of consciousness, adjoining which is the KanakaSabha or the Golden Hall, both these structures resting on a raised platform. The innermost prakaram surrounds this shrine, and to the South West of Nataraja, is the shrine of Govindaraja Perumaal facing the East. The Chitsabha, the holiest shrine in the temple, is a wooden structure supported with wooden pillars, with a hut shaped roof. It is in this hall, that the images of Nataraja and Sivakami are housed, in front of a set of two curtains, the inner (invisible) one being red in color, the outer one being black in color. To the right of Shiva, is the revered Chidambara rahasyam - or a representation of the concept of nothingness (space) garlanded with golden vilva leaves. The curtain in front of the Chidambara Rahasyam, representing Shiva (and Parvati) in the formless form (Aroopam) is lifted ceremoniously during worship services, with offerings of lamps. Also in the Chitsabha are images of Ratnasabhapati (Nataraja of Ruby), the Spatika Lingam of Chandramauleeswara, Swarnakarshana Bhairavar, Mukhalingam etc. Across from the Nataraja shrine in he second prakaram is the Nritta Sabha or the hall of dance with some fine pillars, housing an image of Shiva in the Urdhva tandava posture, winning over Kaali in a dance duel, and an image of Sarabheswara, another form of Shiva (said to have quelled the ugra swaroopam of Narasimha). The Nritta Sabha with fine pillars is in the form of a chariot drawn by horses. The Deva Sabha or the house of Gods is also in the second prakaram, housing festival images of the Pancha Murtis (Somaskandar, Parvati, Vinayaka, Subramanya and Chandikeswara) and other deities. Mulanathar, or the representation of Shiva as a Lingam (Aakaasa Lingam) is housed in the second prakaram. The outermost prakaram is home to the grand Sivakami Amman temple, the Sivaganga tank and the 1000 pillared hall or the Raja Sabha, where Nataraja is brought during two annual festivals. The vast Sivakami Amman shrine is a temple in its own right. 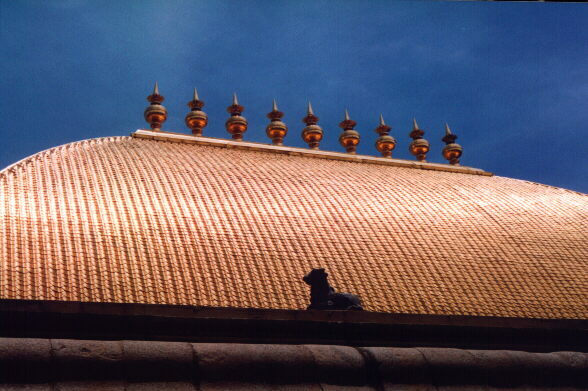 Ceilings on the mukhamandapam of this temple have paintings from the Nayaka period. There are friezes of dancers, drummers and musicians all along the enclosing walls of this temple. The thousand pillared hall has witnessed several grand events in history. This hall is also designed in the form of a chariot. Its entrance features two elephants, and on the basement there is a frieze of dancing figures. The 100 pillared hall, also in the outermost prakaram is also of artistic value, as is the shrine of Subramanya, which dates back to the Pandya period. The Subramanya shrine is also in the form of a chariot, and is referred to as the 'Pandya Nayakam'. Perhaps the most magnificient structures in the temple are the four lofty gopurams or towers in the four cardinal directions, piercing the walls of the outermost prakaram. Each is a gigantic masterpiece in itself - about 250 feet in height, with seven tiers. The Western tower is the oldest one. In the towers, on either side of the gateways there are representations of the 108 poses of the classical Bharata Natyam Tradition as enunciated in the ancient treatise on dance - the Natya Sastra. The towers are embellished with images from Indain mythology. 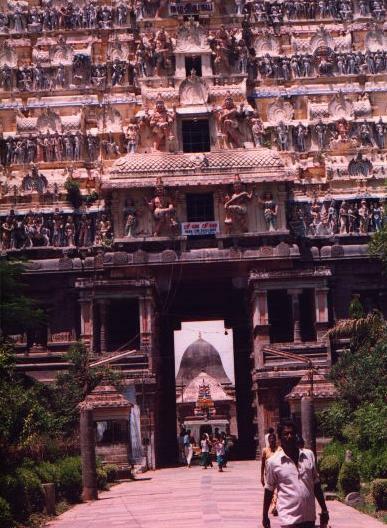 From the second tier onward, on each of the Gopuram, are seen images of various manifestations of Shiva such as Bhikshatana, Kankala (both being ascetic forms), Kalyanasundarar, Somaskandar etc. (bestowers of prosperity). There are no representations of Nataraja on the temple towers, as this image is reserved for the innermost shrine alone.